What is the contact information of the hotel? Is the Don Pancho an Adults Only hotel? The Don Pancho is a Hotel Adults Only (over 14 years old) that satisfies the needs of our guests who are looking for peace and tranquility, and want to relax and enjoy their holidays in couple or with friends. What are the advantages of booking directly with the hotel? Receive free transfer service to and from Alicante airport. Only direct bookings earn discount points on accommodations. More availability, as the latest rooms are only available through direct booking with us. * Applies to bookings of 3 nights or more. ** Not applicable on special non-refundable rate. What are Don Pancho Happy Points? Happy Points is a program designed to reward our loyal guests. Points are earned on every Euro paid at the hotel (drinks and food need to be charged to the room). Those points are then converted into discounts (on food, drinks, etc.) at the guest’s next stay. Guests who book direct earn the most discounts, as their accommodation cost earns points towards their next accommodation. To find out more about Don Pancho Happy Points click here. Personal documents are required in order to undertake the registration at the hotel. We will ask for your identity card or passport for all of the people lodging at the hotel. This information will be scanned as it is required by law. Also, we ask for a credit card as a guarantee for spending which may take place throughout the hotel (telephone calls, restaurant, room service, etc.). What is the dress code at the hotel? Bathing suits and bare chests are only permitted in the pool area. No shorts or ankle length pants are allowed to be worn at dinner time in the dining room or in the dancing lounge except from July to September, 15th where an exception is made. May gentlemen wear jeans at the evening meal? Guests are guaranteed to have their room ready by 4pm the day of check-in. However, whenever possible we try to allow entry beforehand. Check-out time is 12pm. Late check-out may be requested the morning of the day of departure. Please keep in mind that we can’t always accommodate late check-outs. 40€ to keep the room until 8pm. If late check-out is not available, a courtesy room will be made available to our guests so they can freshen up free of charge. If the guests choose late check-out, they can have an extra meal service (lunch and/or dinner) for a special discounted price of 12,50€ per person for each meal service. Yes, WIFI is available and it is free throughout the hotel and most common areas. Yes, the hotel has a parking garage available. The cost is 12€ per night. Please contact the hotel ahead of time to make sure there is availability. Please email info@hoteldonpancho.es or call +34 96 585 29 50. 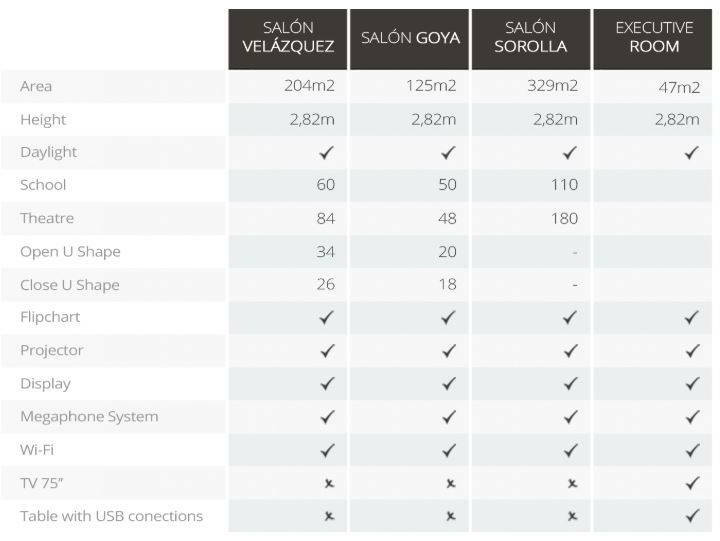 Are there computers with Internet access available to guests? Yes, the hotel has an Internet cafe in the Ground Level which is open 24 hours. It offers our guests free access to computers with high speed Internet access. Is use of the Bowling Green free to guests? Yes, use of the Bowling Green is free to guests. A deposit is required for the use of the bowls, which is then returned after the bowls are returned. Is use of the gym free to guests? Yes, use of the gym is free to guests. The gym is located on the ground floor of the hotel and is open 24 hours a day. When and where can I book a Thai massage? You can book a Thai massage at the Front Desk (in person or dialing 9 from your room). Reservations can be made up to 30 minutes before the desired time of your massage. The massage room is on the ground level. We keep your personal details and any other data relating to you in a safe location, so only those who know the appropriate log-in and password can access them. Your personal details will never be sold, handed over to third parties or used without your permission. Personal documents are required in order to undertake the registration at the hotel. We will ask for your identity card or passport for all of the people lodging at the hotel. This information will be scanned as it is required by law. Also, we ask for a credit card as a guarantee for spending which may take place throughout the hotel (telephone calls, restaurant, room service, etc.). Reservations are entered immediately into the reservation system. Your credit card is the guarantee for your reservation. The reservation amount will not be charged, but the correct operation of the card will be checked. No-shows and cancelations without restrictions made less than 7 days before check-in will be charged 100% of the first night’s stay. If I arrive late or if I do not show up at the hotel, will my credit card be charged? If you are not going to come to the hotel at all, please let us also know as soon as possible. You may cancel your reservation at no cost provided you alert the hotel up to 7 days before check-in (only applicable on reservations without restrictions) . No-shows, guests who never show-up on the arrival date, and cancelations without restrictions made less than 7 days before check-in will be charged 100% of the first night’s stay. If you are going to arrive after 6pm, please let the hotel know so as to ensure we hold a room for you. Please contact the hotel to cancel or modify your bookings: email to info@hoteldonpancho.es or call +34 96 585 29 50. Do all the rooms have baths or do they have walk-in showers? Some rooms have baths with built-in showers, and other rooms have walk-in showers. If you have a preference, please send us an email to info@hoteldonpancho.es or give us a call +34 96 585 29 50. Please submit requests as soon as you can to allow us time to prepare. Requests are not guaranteed but we do try our best to satisfy them. Do the rooms have 2 single beds or double beds? Do all the rooms have tea and coffee making facilities? No; only Superior Rooms, Atico, Suite, and Atico Suite offer these facilities. Tea, coffee, sugar, etc. are replenished daily in those rooms as needed. Does the hotel provide hairdryers? Yes, each room is equipped with a hairdryer. A mini-fridge is available in each room. It is a small fridge (no ice-maker) which is empty. If you would like beverages in your minibar, we kindly ask guests to fill out a form and leave it at Reception. The drinks will be delivered to the minibar in the room in the next 24 hours and will be charged to the guests room account. Are there safes in the rooms? Is there a charge for them? Yes, safes are located in the rooms. There is a 1.60€ per day charge to use the room safe. If you have booked directly with the hotel, the use of the room safe is free. Is air-conditioning available in the rooms all year round? Air conditioning is available all year round. However, in winter, only heating is available and in the summer only cold air is available. Our infrastructure only allows one type of air, hot or cold, possible for all rooms. Usually cold air conditioning is offered from April to November. Hot air is offered the rest of the year… Exact timing depends on the weather. Do all rooms face the sea? Yes, all of the rooms face the sea. However, the higher the floor, the better the sea view. What are the Superior Rooms? How much does the upgrade to a Superior Room cost? The cost is an additional 20€ per room per night (an additional supplement of 7€ in the case of a third person). 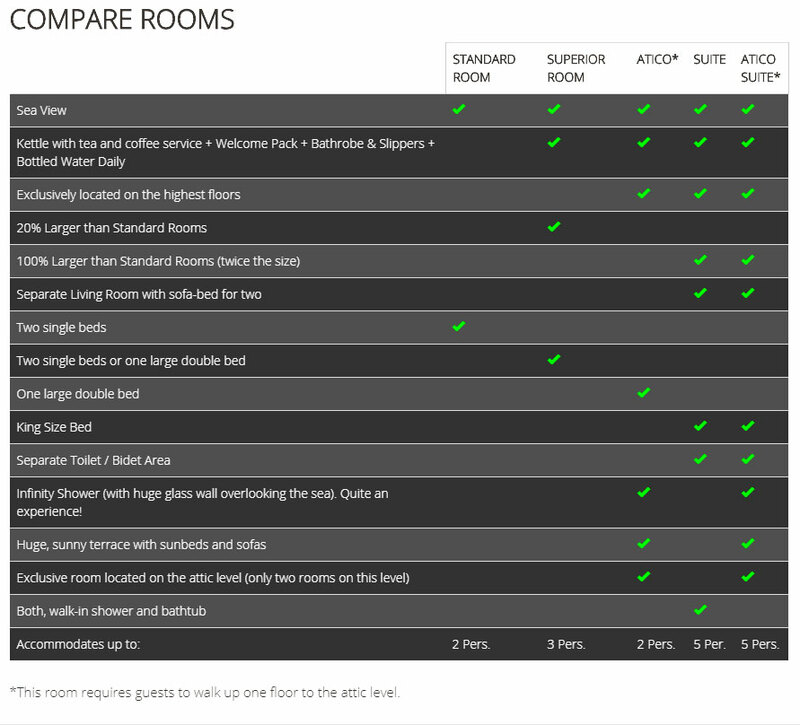 Are the extras in the Superior Rooms okay to take home? If you are staying in a Superior Room you may take home a bathrobe (22€), the make-up mirror (30€), and/or a drinking mug (7€). The slippers are free! The total amount of items taken home will be charged to your room / credit card. You can also check our Don Pancho shop here to see all available items and their prices. Yes, we have a magnificent Suite, a one-of-a-kind Atico Suite, and an Atico room with a huge terrace available. You can find out more about them by clicking here. Why should I charge drinks to the room? Every Euro charged to the room earns Happy Points, which are converted to discounts on the guests’ next stay. That is why it is beneficial for our guests to charge drinks to the room. If I check-out early before the restaurant opens for breakfast, can I still manage to have breakfast at the hotel? On Tuesdays and Saturdays the restaurant opens at 6am for a continental breakfast. If your departure is before 8:00 on any other day, please tell the Front Desk before 20:00 the day before and a breakfast tray will be delivered to your room the night before. What are the hours of operation of the restaurant? Is the pool bar open all year-round? Yes, the pool bar is open year-round, except on certain days when the weather isn’t pleasant. I have food allergies, should I alert the hotel? Please just notify the hotel by email before you come and/or remind the maître at the restaurant when you arrive for your first meal. The maître and the chefs will work together to point out the acceptable foods and, if need be, cook something special for you. Can I switch lunch for dinner if I am on half-board? Sure, we are flexible!If you are on half board, you can choose to have either lunch or dinner without notifying us in advance. Are mobility scooters allowed inside the hotel? Mobility Scooters are not allowed inside the hotel. There is an area at the entrance of the hotel where mobility scooters can be parked and charged. Is there a place to park and charge my mobility scooter? Yes, there is a parking area at the entrance of the hotel where mobility scooters can be parked and charged. The cost is 2€ per day. Does the hotel hire mobility scooters? The hotel does not hire mobility scooter but can arrange the service. The external service will deliver and pick up the scooter at the hotel to make it easier for or guests. Does the hotel hire wheelchairs? The hotel has a wheelchair on-hand to help guests comfortably arrive into the hotel but it is not lent out to guests and can only be used for a few minutes so it is available for the next guest. The hotel can arrange for guests to hire wheelchairs through an external provider. The external service will deliver and pick up the scooter at the hotel to make it easier for or guests. Does the hotel have wheelchair and/or handicap accessible rooms? Our hotel does not have adapted rooms. Superior rooms are larger, so disabled guests can move around them more comfortably than in Standard rooms. Access to the hotel and common areas is possible for those in wheelchairs. How far from the beach is the hotel? The beach is 100 meters away from the hotel. Our hotel is very centrally located, close to the beach and the nightlife. All of the rooms face the sea. How far from the nightlife is the hotel? The hotel is in the center of Benidorm’s nightlife. Bars, discos and pubs are right around the corner. It is a 15 minute stroll or a 5 minute bus ride. The bus stop is located in front of the hotel. How does the free bus transfer service work? 1) This service is provided by a partner called Resort Care. 2) ON ARRIVAL INTO ALICANTE AIRPORT All passengers should present their booking confirmation to the RESORTCARE representative at the RESORTCARE DESK located on level: minus2. Level 2 lies directly below the Arrivals hall, on the same level as the coach park. Should you have any difficulty finding RESORTCARE, please call them for assistance: Telf (0034) 96 588 9094 (24hrs). 3) You may have to wait up to 60 minutes for your shuttle bus and there will be various stops on the way to the hotel. Once departing the airport you will have a maximum driving time of approximately 90 minutes. 4) 7 days before you finish your holiday to confirm your return details and time of pick up with the Don Pancho Front Desk. The free shuttle service will pick you up right in front of the hotel however you must be on time because the bus will not wait as many passengers from other hotels are onboard. Is there an iron and ironing board available at the hotel for guests use? No, currently we do not offer this service however the hotel does have a laundry service available to guests at a charge. Are their laundry facilities available at the hotel? Yes, the hotel does have a laundry service available to guests at a charge. Fresh pool towels are available at the Front Desk and may be exchanged for clean towels. Are outside food and drinks are not permitted into the hotel? It is not permitted to bring outside food or drink into the pool area, bars, and restaurant or common areas of the hotel. Is a luggage room available? Yes, a luggage room is available free of charge for guests to store their luggage before their departure time. Smoking inside the hotel is strictly prohibited. Guests may smoke in the outdoor areas of the hotel unless they are marked as non-smoking areas. Do you have an in-house doctor? We do not have an in-house doctor yet we do have a trusted doctor who makes house calls on request. The doctor does charge a fee to his patients and if the condition is serious the doctor and the hotel make arrangements for the patient to be sent to the local clinic or hospital. We take great pride in making our clients feel at home here and we make sure we find them the help they need while under our roof. Does the hotel have a newsletter? Yes, we do. You can sign up by filling out the footer form. Sign up to our newsletter now. Don’t miss our latest news, exclusive promotions and more! What do I do if I have any concerns, complaints or special requests? Please ask for our Guest Relations Manager at the Front Desk or email directly to info@hoteldonpancho.es.